With a little peanut butter thrown in for good measure. Sitting on a fluffy marshmallow pillow. All carried by a chewy, melty chocolate chip cookie. Fortunately for you and I… yes. Unfortunately for my pencil skirt that I wore without knowing to take the X off the back…. yes. Is it also real life that I can eat more than three of these dessert monsters after a long day in the classroom? And then give myself a workout pass (pass meaning no thank you I’d rather not) because I’m too full? Whatever life that is, I’m stuck in it. Helppp. A quick thanks to Pillsbury for this killer dessert bar recipe. Also a quick shout out to Pillsbury for sabotaging my three day health kick. Remember that whole P90X thing? …Yeah, me neither. 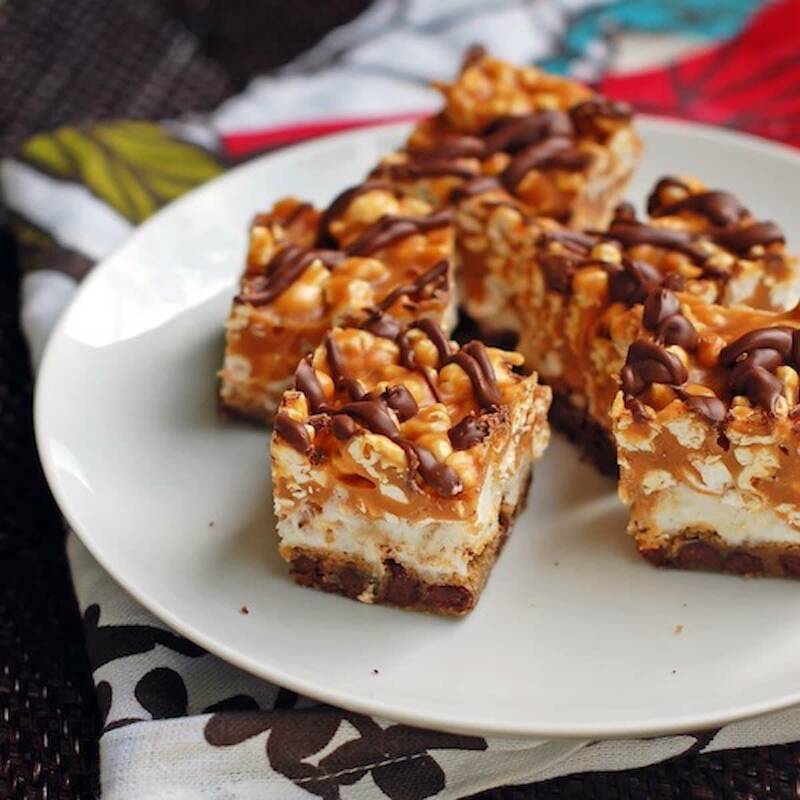 These caramel corn bars have a cookie base and a marshmallow caramel corn topping, drizzled with chocolate. So addicting! 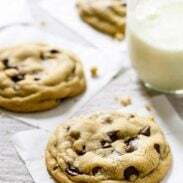 Press cookie dough into the bottom of a square baking pan (8×8 or 9×9). Bake at 350 for about 15 minutes or until the surface looks dry and starts turning golden brown. Start melting corn syrup, butter, and peanut butter chips over medium heat. Once cookies have been removed, sprinkle marshmallows on top of cookie layer and put back in the oven for 5 minutes until they puff up. Caramel corn and peanut butter and chocolate chip cookies and marshmallows. They’re calling your name. I recommend that you listen. They ARE chewy – the popcorn stays nice and chewy, and so does the cookie crust. Oh my goodness, these look amazing! I’ve got some popcorn and I’ve been wondering what to do with it and now I know! Popcorn and sweets?! Hmmm, I’m all over that! Ummmm….are you serious?!?! These look soooo good! So true! A crowd pleaser. Annnnnnd I’m drooling. I don’t think these bars are missing a single thing! I know – how could you possibly add anything else?? They’re intense. That’s about how I feel. 🙂 Wednesday nights are reason enough. Love the new look to the website and the ability to print the recipe easier! Hope your year is starting off well!! Thanks Becky! I am happy about the new look, too. Hopefully it’s more user-friendly! This is the most perfect fall dessert EVER. It’s beautiful and delicious-looking and just YES!!! “just YES!” 🙂 That’s how I feel, too! Oh my lord, are you trying to expand my waistline because if so you have succeeded with this amazing looking dessert!! Haha. I’m just trying to make your stomach happy. If one were to use regular popcorn, about how many cups do you think this recipe requires? I think one bag of microwave popcorn makes about four or five cups. 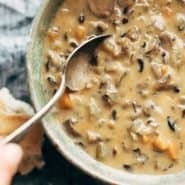 I don’t think I’ve ever repinned, clicked a link, and clicked print faster than with this recipe! Wow, oh wow. My little Dudette will be a happy camper when she gets home from school. Of course, her mother and father will be happy a couple of hours before that, but we HAVE to test it after all, right? Thanks for sharing these amazing bars! These look divine!! I must add them to my fall baking list! Yes you must! You won’t be sorry! These look so good and super addicting! I can see them being a huge hit. LOL. Glad you liked them? Ha. Genius credit goes to Pillsbury. Glad he liked them! These look sooo yummy !! I made these for a dinner party last night and there were INHALED! Thank you! Posting it on my recipe page (and linking back of course!) now! Can’t wait to make them again. Thanks Christy! Glad you liked them. Oh – YUMMMMMMMMMM. Going to try these – they look A-MAZE-ING! Thanks for sharing!